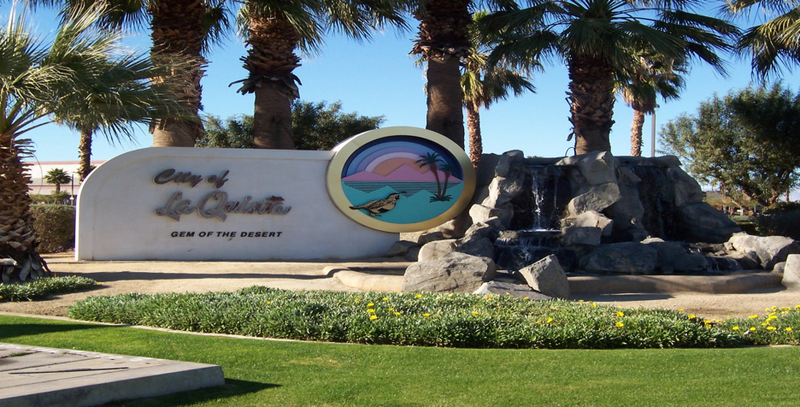 La Quinta is nearly surrounded by the Santa Rosa Mountains and is located on the floor of the Coachella Valley. When the floor of the valley began to sink, it was covered by the Pacific Ocean. Over a period of hundreds of years, the Colorado River flowed into the Gulf of California and formed a large delta fan. Silt basin deposits grew higher and wider until the basin was cut-off from the ocean, while the mountains on both sides grew higher. When the Colorado River changed its course five hundred years ago, the east Coachella Valley flooded creating the freshwater Lake Cahuilla. You can still see the lake`s water line today along the base of the Santa Rosa Mountains. The first scheduled trains began operating between Los Angeles and Indio in 1876, as the Indio area had a plentiful water supply. Farmers were able to get their vegetables, melon, citrus and date crops to metropolitan areas. La Quinta`s climate was ideal for growing exotic dates, sweet corn, Bermuda onions and Thompson seedless grapes. Official bird - Gambel`s Quail (Lophortyx gambelii). North La Quinta is a residential area highly sought after by permanent residents, including white, blue, pink and gray collar workers plus second home owners and snowbirds, as well. It features 7 gated and 20 non-gated developments/areas, most within walking distance to Amelia Earhart Elementary, John Glenn Middle and/or La Quinta High Schools. Each of these schools is in the Desert Sands School District (Some properties may fall into the boundaries of Gerald Ford Elementary, Colonel Mitchell Paige Middle School and Palm Desert HS). They are California Distinguished schools with International Baccalaureate programs. Living in North La Quinta affords you a central valley location with quick access, locally and valley-wide, to the numerous venues available to residents and visitors whether it`s golf, tennis, shopping or dining you might have in mind. You might also consider the La Quinta library, stroll the shops in charming Old Town La Quinta including Art under the Umbrellas. Hiking and biking trails in the La Quinta Cove allow you to experience the beautiful nature and mountains up close and personal. There is the La Quinta museum or you might even take in a movie at the Cinemark NexGen Theatre. North La Quinta also boasts 5 parks - Monticello, Adams w/sand volleyball court, La Quinta, Desert Pride and Pioneer – where the 2 North La Quinta dog parks are located. Once you`ve settled here, you`ll find many fun and exciting opportunities to fill the day or help you put the work week behind you. La Quinta, the `Gem of the Desert` is truly a wonderful destination for individuals and families alike. North La Quinta single family home sales during the 2018 season from January 1, 2018 through June 30, 2018 totalled 92 with the average property being 2,127 square feet and selling for $395,228. The low sale was at $232,500 and the high was at $635,000. North La Quinta condo sales during the same period totalled 28 with the average property being 930 square feet and selling for $194,211. The low sale was at $145,000 and the high was at $255,000.